The Bristol Balloon Fiesta is celebrating its 40th year and is set to attract the biggest crowds to date. Between the 9th -12th August 2018 at Ashton Court Estate, thousands of spectators, both young and old, will have the privilege of watching over 130 hot air balloonists take to the skies to create the most colourful display over the four day Fiesta. What makes the spectacle so enticing is that is is completely free, leaving friends and family to enjoy the celebrations even more! Over the weekend you can expect to see multiple balloon flights filling the skies at sunrise and sunset, as well brand new special shape balloons being revealed just for the festivals’ 40th anniversary. Year after year the Bristol Balloon Fiesta has wowed crowds with unusual special shaped balloons, however, this year not even the balloonists themselves know what is going to to be unveiled in the balloon arena! So keep your eyes peeled for quite possibly the most elaborate balloon design to date. What makes the Bristol International Balloon Fiesta so unique, however, is the diverse range of activities which allow family and friend members to get hands-on and interact with those in the know. Bailey Balloons, alongside sister company Aerosaurus Balloons, will be at their company stand throughout the weekend. They will be offering visitors the chance to step into the basket and get a feel for what to expect on a hot air balloon, as well as being able to purchase hot air balloon rides. If the time is right, there will also be the chance to meet the pilots at the stand and get to know a little more about the majestic flying experience. Although each day provides something a little different across the Fiesta weekend, there is something for everyone to enjoy. Of course, ballooning is weather dependent so listen out to the PA system across the weekend, and if we are unfortunate to experience wet and windy weather there is plenty more to explore around the grounds! Live music will be enticing the crowds, as well as a funfair for the kids (and the big kids), trade stands and arena entertainment including Wing Walkers performance, a Pitt Special and other aerial displays. The pinnacle each year, though, has to be the night glow and firework display which will both take place on Thursday 9th and Saturday 11th at 9 pm. Crowds gather to watch the balloons light up the night sky creating the spectacular Night Glow. The hot air balloons are lined up, tethered to the ground and lit up in time with the festival’s specially commissioned music. This enables spectators to experience the true beauty of the balloons in a different light and sound. Finally, a firework display to end the days’ activities will fill the night’s sky. The vibrant colour which encompasses the beautiful city of Bristol attracts individuals outside of the ground too. Clifton Suspension Bridge, as well as Bristol Harbourside, play important roles in enabling access to the best views and backdrops outside of Ashton Court Estate. So if you are unable to make one of the Fiesta days for any reason, make sure to look up at the sky, as you may be pleasantly surprised as the balloon spectacle will be viewable for miles around. For those travelling to Bristol for the Fiesta, there are plenty of public transport routes in and around the city to accommodate your travel needs. There is also on-site parking at Ashton Court for the day at a cost of £10 which you are recommended to book on the Fiesta website in advance. We look forward to seeing you there! 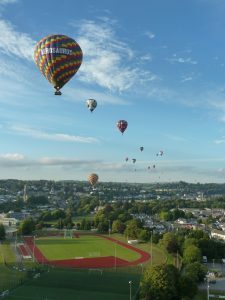 We can’t wait for 40th annual Bristol International Balloon Fiesta this year. For us balloonists, the weekend is the equivalent of Glastonbury Festival! If you see us or one of our many balloons there, say hi, or wave from the ground! If you’d like to fly in one of our balloons over the weekend, either purchase a ticket now or give us a call and we will be happy to help.